The word ‘Plastics’ comes from the term ‘Plasticity’ which is a property of anything that can be re-moulded into diverse shapes and sizes under certain conditions. Chemically, plastics are organic polymers of high molecular mass. A number of hydrocarbon units are joined in a sequence to give rise to the plastic material with desirable properties of strength, malleability, temperature tolerance and chemical resistance. Thus, different types of plastics are known.ften while working with plasticware, it becomes necessary to know the actual material your beaker or petri plate is composed of. Once you know about the composition, you can easily find out details such as chemical resistance, temperature for autoclaving and the material best suited for your experiment. This is important because you surely don’t want to end up frying your petri plate or blowing up your centrifuge tube in the oven! Even when you are browsing through our website, you will encounter terms such as ‘Polypropylene’, ‘Polyethylene’ etc. and one must often think “What’s really the difference between all these?” Well, we help you figure that out just about now! This is one the major classes of plastics. Thermoplastics attain the property of plasticity at a certain temperature and solidify when cooled. Upon lowering the temperature, these plastics become hard and durable and are set firmly into the desired shape. Common thermoplastics include polyethylene (PE), polyvinyl chloride (PVC) and polypropylene (PP). Their main features include high strength and flexibility. 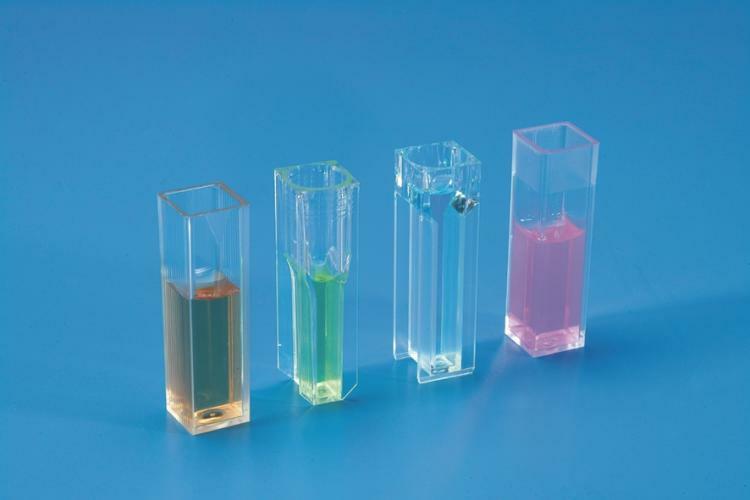 An extremely high number of labware is manufactured using Polypropylene (PP). The reason for this is due to certain features of PP including tensile strength and flexibility. It offers good chemical resistance and can withstand temperature between 0°C to +125°C. These features can be attributed to its linear polymeric structure composed of the repeating unit CnH2n. It is translucent and waxy in appearance. Many lab & medical products including measuring cylinders, sample containers, funnels, freezing tubes, syringes etc are composed of PP. PVC is the plastic found in your windows, door frames, carpet backing, pipes and fittings, wires, cables etc. It often combines the desirable properties of good chemical resistance, thermal stability, rigidity, transparency, electrical stability, low gas permeability and good weathering ability. It is a brittle polymer of vinyl chloride often made rigid by adding a plasticizer liquid. As and when this liquid wears off, the plastic can lose its strength. However, do not store anything edible in containers made of PVC. It can be harmful if ingested. You must’ve often heard of ‘PET Bottles’, the ones that contain your flavored soda. 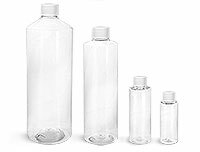 Well, PET here stands for the plastic material Polyethylene Terephthalate formed as a result of a condensation reaction between ethylene glycol and terephthalic acid. This is the ‘microwavable plastic’ you use for heating your food. It combines the properties of good heat and solvent resistance, hardness and malleability. It is due the good malleable property that the plastic can often be drawn into fibres and used for clothing purposes. It is a hygroscopic plastic known to absorb water from its surroundings. Polystyrene is an amorphous thermoplastic which has glass-like appearance. It is rigid, clear, brittle, semi-crystalline and dimensionally stable. It offers moderate chemical as well as thermal stability and may often crack under stress. It is affected by fats and solvents. It can tolerate temperature within the range -20°C to +70°C. It cannot be easily recycled. 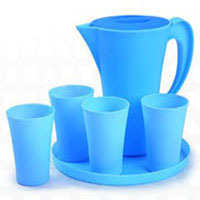 Common items made of PS include foam, plastic toys, plastic cutlery etc. Cuvettes and containers are made of PS. PTFE, also known as Teflon is formed by polymerization of tetrafluoroethylene molecules. PTFE has many unique properties such as being waterproof and frictionless. Being hydrophobic, water doesn’t come anywhere near these highly stable fluorocarbon molecules making it waterproof. Because of its frictionless property, PTFE is used as a lubricant. 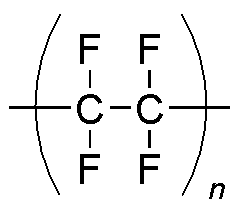 The stable fluorocarbons make PTFE almost non-reactive allowing storage of highly reactive and corrosive chemicals. The non-stick coating on your pan is PTFE, as it offers high heat resistance. PTFE coating is also present in magnetic stirrers and containers for corrosive acids such as hydrofluoric acid. 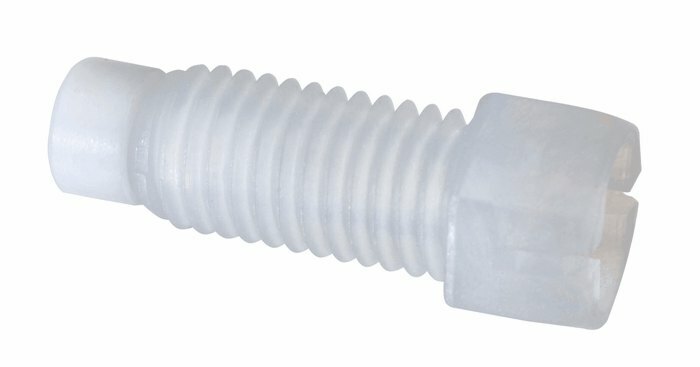 PTFE plugs and stopcocks are commonly used in labs. Polyethylene is among the most common plastics used. There are two type of polyethylene – High Density PE and Low Density PE. It was formed as a result of polymerization of ethylene in the presence of various metals. HDPE is the harder, tighter and denser version. It is named ‘high density’ because it sinks in alcohol-water mix (whereas, LDPE floats). The PE fibers forming HDPE are more organized to give the plastic its strength. HDPE was first used for making hula loop. It is now used for making containers, bottles, scoops, beakers. It has good thermal stability and higher melting point as compared to LDPE. It is transparent and has increased tensile strength. It has good chemical resistance and can withstand temperature within the range -50°C to +150°C. 8. Low Density Polyethylene (LDPE): Well, this is the softer version of polyethylene. It floats on alcohol-water mix and hence is called ‘low density’ PE. It is less rigid and more flexible as compared to HDPE. Offers good chemical and moderate thermal stability. It has a lower melting point and can withstand temperature within the range -50°C to +80°C. it is often used to make the squeezy wash bottles, dropping pipettes etc. This is the ‘rough & tough’ plastic that is essentially unbreakable! It is a linear polymer of carbon dioxide with excellent clarity offering high visibility. It is a light weight polymer that combines properties of high tensile strength, high heat resistance and very good thermal stability. It can withstand temperature within the range -130°C to +125°C. However, it offers only moderate chemical stability. It may lose its tensile strength when autoclaved or exposed to alkaline detergents. PC is difficult to recycle. 10. 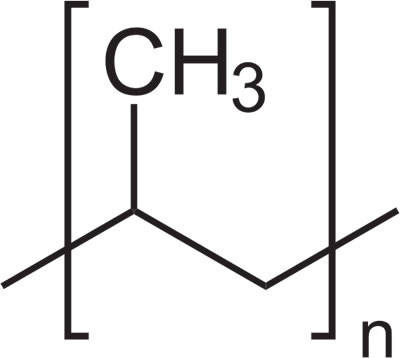 Polymethylpentene (PMP): A polymer of methylpentene units, PMP is manufactured under the name ‘TPX’ by Mitsui Chemicals. It is a hard, solid plastic that is light weight and of low density. It has exceptional acoustical and electrical properties. PMP is used for cookware, gas permeable packaging, microwave components and autoclavable medical and laboratory equipments. It has high melting point and offers good thermal stability. It is a transparent material with excellent optical properties. PMMA also known as acrylic is a thermoplastic used as a shield to provide protection against beta radiation emitted from radioisotopes. 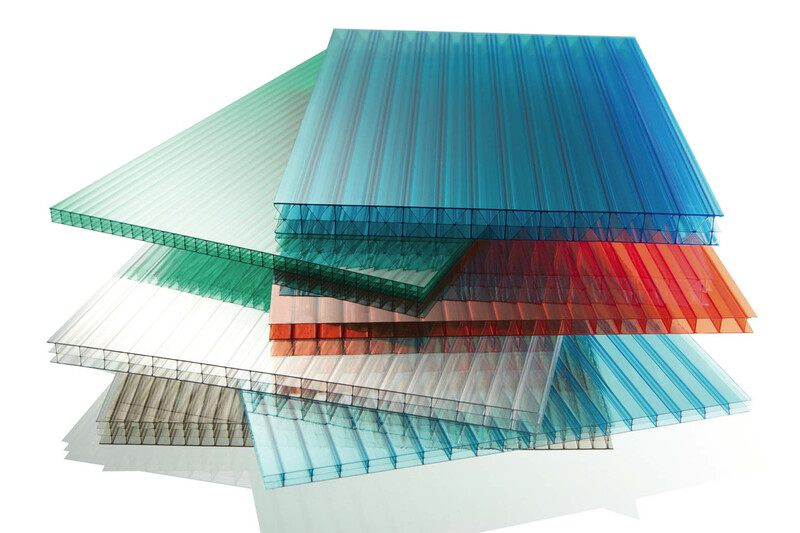 It is a strong and lightweight material with better impact strength than glass and PS. It filters UV light at wavelength below 300 nm. Melting point of PMMA is 160°C, whereas ignition temperature is 460°C. It is often used in sheet form. It is a safer, less strong alternative to PC. 12. Acrylonitrilebutadiene Styrene (ABS): ABS is a terpolymer formed as a result of polymerization reaction between acrylonitrile and styrene in the presence of polybutadiene. In this polymer, each component contributes to the unique properties that make ABS. The polar nitrile groups attract each other and provide the strength. Styrene makes the plastic shiny while polybutadiene being a rubber-like substance itself, provides the resilience at low temperatures. ABS is tough and has good impact resistance. Temperature range -20°C to +80°C. Melting point is 105°C. These are the general properties of the plastics found in your lab. Be sure to know the basic details before you end up blowing up the plastic. Abdos. (2015). Abdos International Catalgoue 2015. Roorkee, India. Images were sourced from Google Images (primarily).